First, I want to make it clear that the purpose of fasting and of the Daniel Fast is not all about health. Remember, the definition of fasting is “to restrict food for a spiritual purpose.” So seeking a deeper relationship with God is the primary purpose of fasting. With that said, there are some powerful benefits to Daniel Fast. One of those is that many people find their cholesterol lowers after they have been on the Daniel Fast for 21 or more consecutive days. So why is the Daniel Fast so good at lowering cholesterol? The main reason is that the eating plan includes so much fiber (a.k.a. roughage). Fiber is a powerful part of food and sadly, most western diets contain very little of it these days. Fresh fruits and vegetables, whole grains and beans are all packed with fiber. And the great benefit of it is that it helps in the digestive process! Now here is the little known fact of why that it so important to hour health and why eating adequate fiber lowers cholesterol. During digestion, our body created bile to help digest the food. However, undigested bile is what increases cholesterol. When we eat enough fiber, it kind of scrubs our intestines, absorbs the left-over bile, and then eliminates it from our body! That’s a good thing! If the bile builds up it goes into the blood stream, turns into cholesterol and then the build-up starts. The Daniel Fast is totally plant based with lost of whole grains, fruits, vegetables and beans. So when you eat these fiber rich foods for an extended period of time, your body starts the cleaning process with the help of the fiber scrub brushes and your cholesterol count goes down. Very cool in my opinion! To make things even better, fiber also contributes to preventing cancer and also aids in slower sugar absorption which is good for those with diabetes. Plus, fiber makes us feel fuller and thus reduces the appetite. So, if you have high cholesterol, then the Daniel Fast is a sure prescription for helping you toward better health! I am writing this post on Ash Wednesday, 2009. Today marks the first day of Lent for millions of Christians throughout the world. Lent is a period of fasting for 40 days prior to Easter, with most fasting six days and week and then eating moderately on Sunday. The big feast is on Easter as we celebrate the most important day of the entire year – Resurrection Sunday! Many will “give up” a type of food during Lent, such as chocolate or coffee. However, a growing number of followers of Jesus Christ are using the Daniel Fast for their Lenten discipline of prayer and fasting. If you are using the Daniel Fast as your method of fasting during this time of consecration, I do encourage you to sign up for the Daniel Fast Mailing List by going to www.Daniel-Fast.com so you can receive periodic free information that will help you be successful in your fast. Also, when you do sign up you will receive an invitation for the free Daniel Fast Notes, which are daily email devotions that receive very positive reviews from readers. Also, since so many people do the Daniel Fast for 21 days (see Daniel 10) you will find the 21-day reference throughout this site. However, the Daniel Fast is not restricted to only 21 days. So a 40-day Daniel Fast is totally appropriate. God bless you on your Lenten Fast. My prayer is that you will draw closer to the Lord and receive even more of the love, grace and direction He has for you. 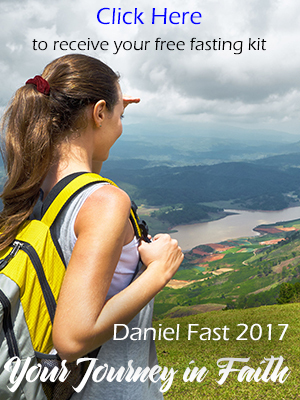 I wanted all readers to know that you can find answers to many of your questions at www.Daniel-Fast.com/faq.html, which is a page on the new website I built to help support you toward a successful fasting experience. You will find many answers there. Also, if you don’t find an answer to your question, please submit it by sending an email to me (you will find the address at the site). I will answer and then also add the response to the site to help others in the future! Many men and women will complete their 21-day Daniel Fast over the weekend. And so I wanted to post some advice about ending your fast. Even if you are not concluding your fast, please keep this information in mind. It is important. Ease back into your “typical diet.” This is especially true with caffeine, sugar, fatty foods, meat and dairy products. Small portions are wise and go slow, perhaps just one or two foods per day. Don’t be surprised if you feel tired after you start eating the “typical foods.” Your body has been detoxed over the 21-day Daniel Fast and it might scoff at what it has to digest! Continue to drink lots of filtered water, at least 1/2 gallon a day. Also, consider the lessons you’ve learned and the good habits you’ve adopted on the Daniel Fast. Don’t leave them behind, but let them become a regular part of your life. This includes your prayer and study time with the Lord as well as improved eating habits. Finally, while you may always fast at the New Year, consider fasting at other times of the year. Many parents pray and then fast from dawn to dusk on their children’s birthdays. If you have pressing issues or circumstances facing you, consider a time of consecrated prayer and fasting. Last year I fasted during Pentecost seeking the Lord’s direction for some personal business matters. The Daniel Fast is an excellent method for a partial fast. It beats John the Baptist’s fast — honey and locust! This is just a quick note to let you know you can find more free recipes for the Daniel Fast at www.Daniel-Fast.com. Just click on “recipes” and you will see where you can access the free Daniel Fast recipes. Also, you can receive the Daniel Fast Guidelines in brochure form by requesting it at that site. When you join the Daniel Fast mailing list, you will receive several sets of Daniel Fast recipes along with ideas and tips for your successful Daniel Fast. I hope you are experiencing a meaningful Daniel Fast. This is a powerful way to connect with God in a more intimate way. The Daniel Fast is a plant-based partial fast. It is based on the Prophet Daniel when he was under the rule of Babylonian kings for their personal service. Daniel recorded three occasions of fasting, though he likely fasted many more times since he was a man of God. Daniel 10:2, 3 is where we find the model for the 21-day Daniel Fast. From this passage, a guidelines have developed over the years, primarily by Christians who use this as a form of fasting. The Daniel Fast has grown in popularity over the last 3 or 4 years as it’s been championed by Pastor Jentezen Franklin of Gainesville, GA.
No Pleasant Food: This would include breads, sugars and sweet foods. No Wine: This restriction, coupled with previous fasts where Daniel drank only water (which is typical for biblical fasting), is where today’s Daniel Fast finds its roots for water only. Fruit and vegetable juices are acceptable. See The Daniel Fast Food List for more details. For a collection of recipes and menu plans that will take you through an entire 21-day Daniel Fast, click here. Spiritual Fasting: The Daniel Fast is a restriction of food for spiritual purposes. So the fast addresses not only the body, but also ones spirit and soul. For more complete information about the Daniel Fast (and to have all the information easily accessible) consider The Daniel Fast for the Body Soul and Spirit. We are coming up to the first day of the New Year Fastthat Jentzen Franklin promotes. Pastor Franklin has motivated tens of thousands of people to start the 2011 New Year with prayer and fasting. Many who will join in this 21-day fast, which begins Sunday, January 9th, will use the Daniel Fast as their method of fasting. You can get a copy of the Daniel Fast Guidelines by going to www.Daniel-Fast.comand adding your mailing list so they can be immediatly downloaded to you. I’m glad that you reached this site if this is the first time you’ve been here. We have a whole community of men and women who practice the Daniel Fast at least once during the year. Many of us use the Daniel Fast several times throughout the year as we seek God and want to intensify our time with Him. Jentezen Franklin (this is his spelling, although most people leave out the second “e”) has been a wonderful gift to the Body of Christ by teaching about spiritual fasting and then moving people into the New Year Fast and the Daniel Fast each year. I am so thankful for his devotion to God and His Word. Please take some time to look around on this blog and learn more about the Daniel Fast. Also, if you want a free copy of The Daniel Fast Guidelines in brochure form that you can download on your computer, just fill out the little form at the site below and the document will be emailed to you immediately. Also, but sure to check back to this blog periodically as I will add more content, information, tools and inspirational material over the coming weeks. The Daniel Fast Blogger is catching up! I want to thank everyone for their patience as I continue to catch up on all the comments left on the Daniel Fast blog in the last few days. I think there are now only 32 that still need a response. My little fingers are typing as fast as they can go . . . and I have to admit that by late into the evening (after writing from dawn) my brain just gets mushy and you wouldn’t want my response! All is well and I hope to be caught up by the end of today. I am away from my keyboard for a few hours while I do some volunteer work at my church. But for most of the day I will be tapping away on my computer in my little cottage in frozen Central Washington State (it’s currently -2 degrees – say, “Burrrrr.”). Be blessed as you enter into the New Year fast. And please feel free to contact me with any questions you might have. I love offering you any assistance I can. Oh, one more thing. I am in the process of building another website that I hope will be useful to members of our friendly Daniel Fast Community. You can check it out at www.Daniel-Fast.com but please keep in mind that it’s a lot like me . . . still under construction! Okay, after the last few weeks of designing and putting together a new Daniel Fast website, autoresponders and a new shopping cart . . . I think rocket science really is easier! Please take a look a the ‘new Daniel Fast site that I am currently building. It will be one of the support sites where I can offer all kinds of tools and helps to support you in your Daniel Fast. Please visit it periodically as it will be changing almost every day. The same is true of this Daniel Fast Blog. Now that we have entered 2009 you will find new content, thoughts and information every day. God bless you and I hope the very best for you as you enter the 2009 Daniel Fast. I am writing this post from snowy Washington State! Thankfully, I am near a roaring fire and have a lovely cup of hot Starbuck’s by my side! Oh, life is good. This is one of my favorite times of year. Advent, Christmas, the New Year and the Daniel Fast are all squeezed into these months and they are full of life, creativity and anticipation! I have been very busy completing a new Daniel Fast Cookbook and getting a new site built to help support you, me and others as we engage in this powerful New Year Fast. You can visit the site at www.Daniel-Fast.com but please keep in mind that it is not complete! I am much more of a writer than I am an Internet techie, so a lot of the details take me a lot of time. But God is good and He has put some wonderful and helpful people in my path to help me along the way. Tonight will be one of my favorite nights of the year. For the fourth year in a row I will write my list entitled, “Wow! Look what I did in 2008!” Then I start looking back at all the many blessings and good memories of the year. I keep making the statement, “Wow! Look what I did in 2008,” until I have a list of 100 memories. Not all are mountaintop experiences. Some are sweet conversations with a friend or one of my children. Or sights I’ve enjoyed like seeing a doe and her fawn in my front yard. But other are big deals! They all are listed. And the good thing about not quitting until I have 100 on my list is that I have to dig deep into the memory bank to list them. I get to relive these positive experiences, in a way. And this is a lovely way to capture special moments blessings. This will be my fourth year and I now can look back and use lists from previous years to spark the memories that could so easily be lost in the shuffle of a busy life. I can promise that high on my “Wow! Look what I did last year!” will be the great pleasure I have had in communicating with you and others through this simple little blog. Words cannot express how much you mean to me and the precious gift you are from the hand of my wonderful Abba Father. I hope you end this year surrounded by good things and blessed memories. And that you look forward to the New Year with great joy and anticipation. Oh my, if there has ever been a good time to start the New Year with prayer and fasting, this is it! Many television preachers and evangelists are calling for a New Year fast including Jentezen Franklin and Henry Fernandez. Some will start with a 21-day fast, while others will engage in a 40-day fast. The Daniel Fast is not tied to any specific date or to a period of time. Unlike Lent, which is a 40-day period of fasting before Easter, the Daniel Fast is a “type of fast.” With that said, more and more church bodies and individuals have started a tradition of starting the New Year with a period of prayer and fasting. And since the fast is usually for an extended period of time, most Christians use the Daniel Fast as their method of fasting. Typically, believers who start the New Year with prayer and fasting decide on a 21-day fast commencing on the first Sunday in January. For 2009, that will be Sunday, January 4th. Pastor Jentezen Franklin has been the strongest promoter of the New Year Fast and will again teach on the benefits of prayer and fasting on his television program. You can also learn a lot about fasting on this blog or by reading The Daniel Fast for the Body, Soul and Spirit. I hope you spend some time on this blog as it’s entire purpose is to help men, women and young people in their journey toward a successful fasting experience. After you’ve looked around the blog and you don’t find the answer to a question you might have, feel free to post it here! I try to respond within 24 hours! Be blessed and I hope the very best for you as you seed the Lord through prayer and fasting. Is the Daniel Fast a Cure for Cancer? I just watched an inspirational video about a woman who was diagnosed by four doctors with terminal cancer. They all told her she had less than a year to live. Through prayer, the Lord led her to the Daniel Fast. This is an inspiring story and again shows the wisdom of God and how prayer and fasting can have powerful effects on our body, soul and spirit. Notice the discipline and devotion Jeannie activated . . . consistency and faith are powerful partners. Okay friends, the world is experiencing tough times with the financial markets in a free-fall with no sure end in sight. Perhaps you’ve experienced losses at this time, along with many in the United States and throughout the world. But one thing we know from the Scriptures is that, “We are IN this world, but not OF this world.” And now, perhaps more than ever before in our lifetimes, is when we need to press into God and focus on Him rather than the fear and dread that wants to overtake us. Fasting to “tune up” your spiritual life is a really smart thing to do! Why? Because fasting is setting ourselves apart . . . and centering our lives on God. It’s not just eating differently and expecting some supernatural results. But rather, fasting helps us focus more on God and His Word and as His truth takes root in our heart, we experience the supernatural power of the Most High God. If you are feeling nervous or anxious right not, take this opportunity to pray and fast. You might just start with a three-day Daniel Fast . . . and see how things go. You might want to extend if you sense the Lord calling you to a deeper place of understanding with Him. But as you fast, be sure to focus on the Lord. Get your eyes off the circumstances of this world and on to the promises of God in His Word. Read Deuteronomy 28, do a study on the word “faith,” or read about the many times the Lord helped His people in times of great economic stress. Feed your spirit by meditating on God’s truth! We are His people. He is our God. And He will see us through. Take minute right now and read Psalm 91 and claim the hope and security the Lord has for you as you dwell in the secret place of the Most High. Remember, we are in the world but not of this world. We have another place where we can call home . . . the kingdom of God. So seek Him, His truth and His ways. Then you will find the joy, peace and security only He can provide. For the first time in my Christian life, I am being called to observe the Jewish New Year (Rosh Hashanah) which begins tonight at sundown. This is a two-day celebration and while I won’t follow the traditions exactly, I do plan to take part of some of the powerful symbolic elements. I then will partake in another Daniel Fast and will continue until nightfall on October 9th. This is my first fast during this period, but I felt a strong call from the Lord to use this powerful time in the Jewish calendar to press into some financial goals. While I am not Jewish, I serve a Jewish Jesus . . . and after learning more about this time of year from the Jewish standpoint, it seems a perfect time to fast. September 29th is the beginning of the Jewish New Year or Rosh Hashanah. And while it’s very different from the Time Square dropping ball, champagne and confetti celebrations of American tradition — one thing is common. That is reflecting on the past year and setting plan and making goals for the New Year. Considering the economic challenges in the world today, some personal financial goals I have for myself (to become debt free) and for my business (to solidify sustainable income), and the opportunity to draw even closer to God, I have decided to fast. I will continue my fast through Yom Kippur, or The Day of Atonement. Oh, what a powerful day. Take time to study this most holy day in the Jewish year. You will be inspired, touched and full of praise for the Lamb slain on our behalf! But even though Jesus is my eternal atonement for my sins, the Lord is still very clear that this holy day is to be recognized FOREVER! So I am choosing to recognize this holy day in my life. A time for deep introspection, worship, praise and thanksgiving. We serve and worship a loving and forgiving Father who so wants a deep and intimate relationship with us. Pray and fasting can draw us closer to the Lord . . . and His word says that He draws closer to us as we draw closer to Him. I love being close to the Most Holy God. I am thankful every day that I can come boldly to His throne because of what His Son did on the cross. I am forever grateful for the love, care and grace He gives me! With all that in mind, I will enter this time with praise and expectation! Glory to the Most High God. I receive many questions about getting family members on board for a Daniel Fast, and frequently parents ask about how to motivate their teens to enter into the discipline. So I wanted to share my thoughts about this topic, especially since fasting and the Daniel Fast are growing in popularity among followers of Christ around the world. First, I encourage parents familiarize themselves with the fast and why it is such a powerful discipline. Also, learn of the health benefits of the Daniel Fast as well as the benefits to the spirit and soul. Then, call a family meeting to introduce the Daniel Fast to the other family members. Explain that you (the parents) have chosen to enter into the spiritual experience and that your hope is that the whole family will engage in the fast. Explain what the fast is, perhaps reading Daniel 1 and Daniel 10 and showing them a print-out of the Daniel Fast Food List. However, be quick to explain that you understand that as teens, their food needs are different since they are growing and physically more active. Suggest that they continue to eat chicken and less bread or other foods that would assure their success on the fast. Ask them if this is something they would like to do and what modifications they think might be good. And tell them you want to help them be successful on their fast. If your teen balks at the fast, ask him or her to consider it for a day or two before giving a final answer. If they don’t want to participate, then accept their decision and let it go. Tell them they can change their minds, or decide to fast from soda or candy or some other single food. But since this is a decision they need to make for themselves, let them decide. Younger children should not be required to engage on a full Daniel Fast, however it would be okay to introduce your children to fasting by leading them into a fast from candy or sugary desserts. Remember, a fast should never be harmful to ones body and should guide the believer into a deeper walk with Christ. Fasting is a discipline, but it is not legalistic. There is no power in foods eaten or restricted. The power is in putting your spirit in charge of your soul and your body . . . committing the fast and the time to the Lord and drawing closer to Him as you seek Him with your whole heart. Parents, please offer your comments! Perhaps you have some ideas that can help others as they lead their family into the power and discipline of spiritual fasting. As I write this post, I am listening to an interview with Steve Strang from Charisma Magazine and Jentezen Franklin. They are talking about the great benefits of fasting. Jentezen talks about several kinds of fasting, including the Daniel Fast. I will try to post the link to the interview so you can listen to it when it’s available. One thing that is clear, more and more people are turning to prayer and fasting as they seek a closer relationship with God. Even today, I am finding an increase on the number of people visiting this site, receiving the recipes they need to complete a successful fast, and reading the encouraging posts from people around the world who also are fasting now or have fasted in the recent months. God is moving! He is preparing His people for these days. The Daniel Fast is a powerful way to draw near to God and to bring your needs before the Lord! If you are visiting this site for the first time, I encourage you to spend some time here. There are hundreds of posts, so to get a good start, start at the beginning by going to the first page and then move around and read and learn about this powerful form of spiritual discipline. I know I might step on a few toes with this post, but I just want to make one thing very clear. That is what fasting IS and what it IS NOT! That doesn’t make sense, does it? Fasting is abstaining from food for a spiritual purpose. It always has to do with food, and it’s not about abstaining from other activities. Please uderstand, I am not saying that it isn’t a good a powerful exercise to abstain from an activity such as television to spend more time in prayer, study or meditation. That’s all very good. But it is NOT fasting. Fasting has to do with food. Remember that we are a spirit, we have a soul (also called the flesh in scripture) and we live in a body (like an “earth suit”). When we fast, our spirit-man is taking control over our soul and our body. Our spirit is saying to the other parts of us, “I am in control. I know you feel hungry. I know you may want a slice of bread or a cup of coffee, but you can’t have it. I am in control of you now and you must obey me.” Your spirit is taking charge! Experiencing this kind of discipline helps you grow in faith. It helps your innerman know that s/he can have authority, even when the soul and body don’t agree. Fasting puts all of you on high alert to the things of God. It’s a spiritual discipline unto the Lord. Abstaining from an activity to replace the spiritual discipline of fasting is like saying to God, “I want to do this my way, not Yours. I want Your results, but on my terms.” This is all mixed up. If you want the benefits of fasting, then fast. Give up food or some types of food for a period of time. Take control of your soul and your body. Quicken your spirit. Open it to the Lord and His wisdom. Fasting is of God. The patriarchs, Jesus and the New Testament leaders fasted and prayed when they wanted to focus intently on God. The Daniel Fast is a partial fast because only a partial list of foods are not eaten. It’s an excellent way to enter a short fast if you are new to fasting, and it’s especially great if you are led to a long-term fast, like Daniel did for 21 days as recorded in Daniel 10. Let’s make sure that we keep the fast what it is . . . abstaining from food for a spiritual purpose. For those of you on my email list, I am sorry for my recent absence! I’ve been pouring my time into some new efforts, including writing a Study Guide to one of the most powerful books I’ve ever read! I will be in touch with you about that in the next few days. I truly am amazed by what I have learned and the HUGE difference this understanding has made in my relationship with Christ. It is awesome! I also want to tell you about a fasting book I read by a wonderful woman of God. Her name is Bishop CD Miller. Her book is called The Lord’s Fast and offers valuable lessons in going deep with the Lord when you fast. I encourage you to check it out. God is so good! He is faithful! And the more we learn about living according to Kingdom principles, the more victory we will experience in our lives. From my own experience, the Daniel Fast has served as a significant spiritual discipline in my life to support me in my relationship with the Lord. I know many of you have had the same experience . . . it’s like having a blanket of security wrapped around me as I sanctify my body, soul and spirit unto the Lord. Please drop me a line and let me know how you are doing! Also, let your friends know about this blog. Let’s get the word out about growing in the spirit. More and more people are turning to fasting as they seek a more intimate relationship with God. I can’t even number the many men and women who have stumbled upon this site and believe it to be a blessing from the Lord. That is my hope and my call – to bless God by blessing His people. Peace to you . . . be blessed as you continue to grow in the love and knowledge of Christ. Thank you so much to all of my brothers and sisters in Christ who have added their comments to this blog, written words of encouragement and supported me by purchasing the Daniel Fast Cookbook and The Daniel Fast for the Body, Soul and Spirit. You have blessed me! And I give God thanks for you every day! Many of you know that 2007 was a huge struggle for me . . . but praise be to the Most High God! He is faithful and has sustained me and ministered to me in mighty and tangible ways! One of the most significant ways is through you and your support. We serve an awesome and holy God. My heart if full of praise for Him today! My hope for you is that you too are drawing closer to Jesus every day, receiving the everlasting love He has for you, and accepting His blessings in your life. Be blessed and praise the Lord!